1. Slice the chicken into bitesize pieces. Heat the oil in a frying pan and gently fry the chicken for 5 minutes until thoroughly cooked and there are no pink meat or juices visible. Add the salad onions and cook for 1 minute more. 2. 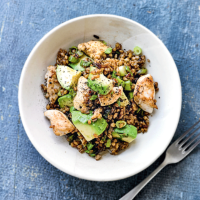 Stir in the cumin, spelt mix and avocado and cook over a gentle heat, stirring for 3 minutes until fully heated. Add the juice from half the lime. Spoon onto plates or bowls and serve with the remaining lime cut into wedges to squeeze over if preferred. This recipe was first published in Thu Jul 06 09:50:00 BST 2017.